Sorry, Swiss 1970s Chandelier is not currently available. - Made of metal, plastic, glass - Made in Czechoslovakia - Original, fully functional condition - Dimension of lampshades is 22 x 11 cm. 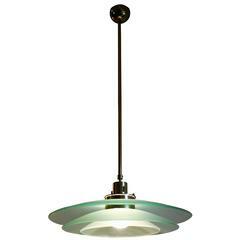 - Made of metal, plastic, glass - Made in Czechoslovakia - Original, fully funktional condition. Sculpted glass and psychedelic fabric for this chandelier in total retro and 1970s look. 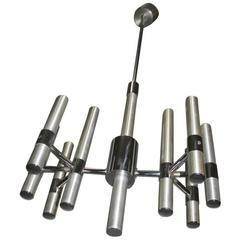 Minimalist chandelier 1970s, metal chromate, eight bulbs. 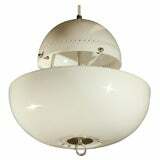 1970s Danish three-light chandelier in the style of Verner Panton Made of opal acrylic. 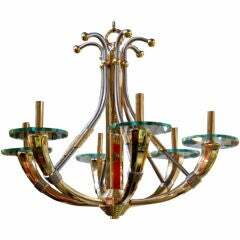 1970 Six-light brass, steel and glass details chandelier in the style of Maison Jansen. 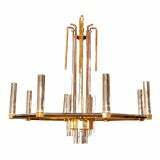 1970s eight lights brass and metal Italian chandelier by Sciolari.